be made in September this year. This decision is now postponed pending the outcome of the nuclear Non-Proliferation Treaty Review Conference in May 2010. This of course means that the whole question of the renewal of Trident is now on hold until after a general election – when the Conservatives are likely to be in power. Nonetheless we must seek comfort from the fact that, for the moment at least, the tide is flowing the right way. and, most of all, President Obama’s own disarmament proposals. In his brief time in office, he has cancelled the Polish and Czech missile defence plans, reached an agreement with President Medvedev on the reduction of their nuclear arsenals and chaired a special session of the UN Security Council on disarmament, which produced a unanimous resolution for creating ‘conditions for a world without nuclear weapons’. Britain’s role in this, in the run up to the Nuclear Non-proliferation Review Conference, remains, in spite of its recent disarmament offers, ambiguous. There is a central contradiction at the heart of the British government policy on nuclear weapons. It talks the language of peace and disarmament but spends its money on new weapons of war. If the government is challenged on what steps it has taken towards nuclear disarmament, which is one of the conditions of the Non-proliferation treaty, it will tell you, amongst other things, that it has reduced the explosive power of its nuclear arsenal by 75% since the Cold War. This is even proudly quoted by our MP in a letter to Brentwood CND in September this year (see over). But this is not a reduction in operational effectiveness. We have got rid of obsolete weapons such as free fall bombs which are highly vulnerable in today’s world of sophisticated air defences and, although we have reduced the number of Trident warheads to no more than 160, we have not reduced the number that are deployed at any one time. It is more about good housekeeping than real disarmament. 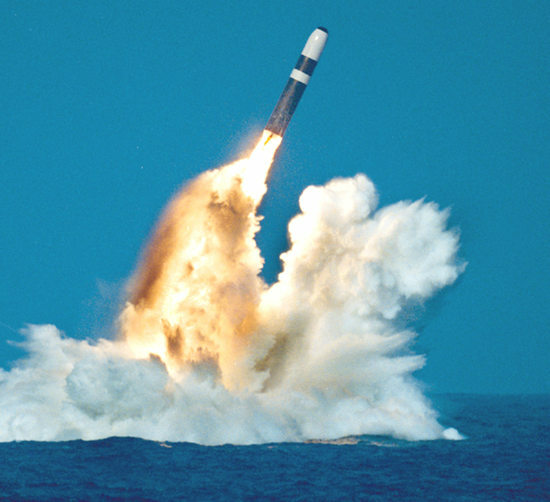 The number of independently targetable warheads – 144 – is the same as 10 years ago and there is no reduction in the number of targets which the Trident system could destroy. Nonetheless, there is a disarmament momentum set in motion and we in CND must seize the unique opportunity which this presents. As part of CND’s campaign to persuade MPs to demand further parliamentary debate on Trident renewal I sent my postcard to Eric Pickles. He first responded by presenting the Conservative case for maintaining nuclear weapons- the usual story that we need them for our security to meet the challenges (as yet unknown and, it appeared, unknowable) of an ever changing world. From reading replies from other Conservative MPs, this is clearly the party line, barely distinguishable from that of most Labour MPs. I replied by asking him 3 questions. 1. Given the ‘threat to our security’ from unknown enemies, present and future, could he ever envisage a time when Britain would not need nuclear weapons. If not, then what was the point in being a signatory to the Nuclear Non-proliferation Treaty? 2. What steps had Britain taken towards nuclear disarmament (one of its obligations under the NPT)? 3. If we need nuclear weapons for our security then how do we explain to the 180 or so countries of the world which do not have them, why they don’t need them too? Thank you for your further correspondence about the nuclear non-proliferation treaty (NPT). I am grateful to you for getting in touch and for bringing your concerns to my attention. The NPT obliges Member States to comply with the three pillars of the treaty: non-proliferation, disarmament and the peaceful use of nuclear technology, but does not impose any legal obligation upon them to abolish (his highlighting) their nuclear arsenals. Instead, Article VI requires member states to engage in future negotiations towards complete disarmament of nuclear weapons. Britain has already taken significant recent steps towards fulfilling its obligations under the NPT. Since the end of the Cold War, Britain has reduced its stockpile of nuclear weapons by around 75%, so that we currently have only around 160 such weapons operationally available. The WE-117 free fall nuclear bombs (dropped by Tornado aircraft) were withdrawn in March 1998. (See comment on this claim on page 1). 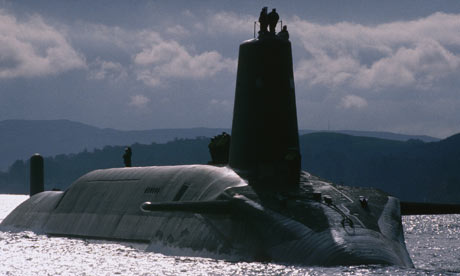 The UK has the smallest stockpile of nuclear warheads amongst the nuclear weapons states recognised under the NPT, and is the only one to have reduced to a single deterrent system. In addition to this, Britain signed the Comprehensive Nuclear test ban Treaty in 1996 which prohibits the testing of nuclear weapons. The NPT has been the cornerstone of world security for 40 years. Conservatives call on our Government, ahead of the crucial review conference of the non-proliferation treaty in 2010, to build now the international consensus to make far harder the illicit production of nuclear weapons and the trading of their components. This, looking ahead, is one of the great global challenges, a challenge to which the next Conservative Government will rise. Once more we see the typical fudging of the NPT requirements whereby the treaty is seen merely as a way of keeping nuclear weapons away from those who don’t have them whilst ignoring the call to those with them to abolish them. However, change is in the air and there is increasing talk of disarmament. In addition to Brown’s offers to reduce warheads and submarines there has been the announcement of a top-level disarmament group formed of ex-ministers and retired military officers. Its members include former Labour ministers, Des Browne, Margaret Beckett, John Reid, Lord Robertson, Conservatives Malcolm Rifkind and Michael Ancram and Liberal Democrat peer Shirley Williams. There are also three former chiefs of the defence staff, General Lord Guthrie, Field Marshall Lord Inge and Admiral Lord Boyce. Such groupings are important, because, in the case of disarmament it is not the technology which is lacking – that is relatively straightfor- ward. The political will is the problem. CND National Conference in October this year was part International Conference and part annual general meeting. 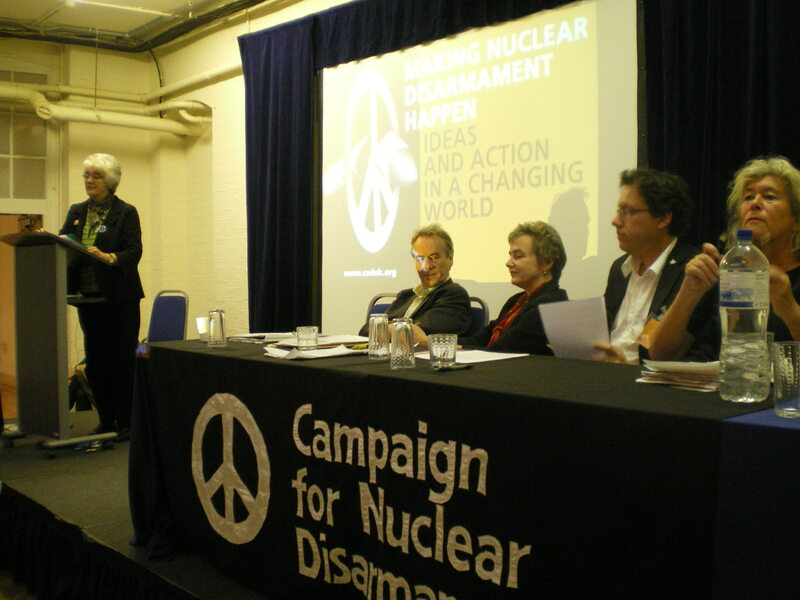 The International Conference presented an enormous variety of speakers and was testimony to the very hard work put in by Kate Hudson, chair of CND, who has been instrumental in expanding CND’s crucial international work. All speakers emphasised the importance of the coming 9 months, leading up to the NPT review in May in New York . In Britain, in addition, we have the twin issues of the Trident replacement debate and a general election we are likely to have at least 300 new MPs, plus, obviously, an even greater number of candidates. There is plenty of work there in terms of lobbying and bringing the nuclear issue into public debate. Kate will be working full-time for CND during this period as she has taken a year’s unpaid leave from her job. In Brentwood we hope to make our contribution with our occasional stalls (see page 4) and some additional campaigning in the run-up to the general election. As NATO troops find themselves increasingly bogged down in Afghanistan, and many member states, want to abandon what is increasingly seen as an unwinnable war, and as British and American troops are being wounded and killed in increasing numbers, we find Britain and the USA contemplating sending even more troops to fight the Taliban. It is perhaps worth trying to recall what reasons have been given us for being there in the first place: it was to find Osama bin Laden and those responsible for the 9/11 attacks in New York, to prevent further terrorist attacks on the West by getting rid of the Taliban and their training camps, to bring democracy to the country, to win hearts and minds by helping development. Not on one single count has there been any success and, after 8 years of war the security situation is worse than ever. NATO’s presence in Afghanistan is acting as a recruiting sergeant for the Taliban. In fact the very real challenge from hard-line militant religious fundamentalism is in Pakistan, a nuclear power and a country of far more economic and strategic importance than Afghanistan which is becoming destabilised by the huge increase in suicide bomb attacks and the NATO air attacks. As always in war the real reasons are never revealed by Governments. Clearly, as is so often the case, this is a war about resources, securing gas and oil pipelines and ensuring that compliant governments are in place to facilitate US domi- nance. More specifically, however, this war is also about the future of NATO. Since the end of the Cold War, NATO, rather than disbanding as did the Warsaw Pact, has been trying to find a new role. As the countries of Eastern Europe embraced free market economies and multiparty democracy, the US moved rapidly to integrate them into the US sphere of influence via NATO. As more and more countries joined this nuclear armed alliance (which has led to nuclear bombs being stationed in Belgium, Germany, The Netherlands, Italy and Turkey) so NATO has constantly to redefine its role as a military alliance. Afghanistan is crucial to this project and NATO cannot afford to be seen to fail. Another fall-out from the Afghan war is the rising numbers of British casualties who will be remembered on Remembrance Sunday this year. This ceremony which once consisted of grieving relatives, for whom it was an important way of mourning their dead, has now become a military-led parade which far from regretting the cruel waste of all the lives lost (both soldiers and their victims), reaffirms the noble and heroic purpose of the military and sees war as acceptable and natural. We best remember the dead by working for peace – so do wear the white poppy enclosed in this copy of WIRE. In the build up to the NPT review conference in May at the UN (and to our own General Election), it is important that we maintain the profile of CND locally and keep nuclear weapons on the political agenda. Before Christmas, therefore, we are running two stalls (near the Beckett Chapel ruins) on 7th November and on 21st November, from 11am – 12.30pm, where we shall be collecting signatures for the No Trident Renewal petition which also includes a plea to support the international nuclear weapons convention to outlaw all nuclear weapons. 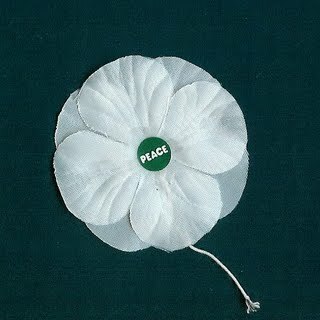 On the 7th November, the day before Remembrance Sunday, we shall also be selling white poppies. Do join us for part of that time if you can – to help out (particularly on 7th) or just to say hello. From 13th – 15th November NATO will be meeting in Edinburgh for its regular parliament session. Scottish CND are arranging a series of events, one of which will be a demonstration on 14th November calling upon NATO to abandon its reliance on strategic and tactical nuclear weapons. Leading members of the Scottish parliament, the main churches and the trade unions will be supporting it – all CND members are encouraged to join (and, perhaps, have a very nice weekend in Edinburgh at the same time). Assemble East Market Street at 12 noon. Program Director at Inter- national Physicians for the Prevention of Nuclear War which is a major supporter of the International Campaign to Abolish Nuclear Weapons, known ‘acronymically’ (and nowadays most appropriately) as ican. The value of John’s contribution was that he was able to bring us back to the basics of why we are so opposed to nuclear weapons – something he often has to do when campaigning for the nuclear weapons convention. In the world today there is a total of approximately 23,000 nuclear warheads. If just 100 of these were dropped there would be 1 billion deaths and 10 years of nuclear winter. He has campaigned in Israel with his message and, as a result, 45 mayors have signed up to the anti-nuclear Mayors for Peace campaign. Eric Pickles was therefore right when he wrote in his letter (see page 2) that Britain had the lowest number of warheads amongst the nuclear weapons states recognised by the NPT but this boast becomes meaningless when one considers their lethal potential. It is certainly no cause for pride. Fundamentalism is a popular topic of conversation so here, with thanks to Bruce Kent is the nuclear version. The dropping of the bombs on Hiroshima and Nagasaki was the only way of ending WW2. Nuclear weapons are safe in sensible hands. That is why we must halt proliferation and hold on to them ourselves. Nuclear weapons cannot be uninvented so they cannot be abolished. There is no link between nuclear weapon development and other global security threats. This is all beyond me and I cannot do anything about it. 11.00 – 12.30 Stall in Brentwood High Street near Chapel ruins. White poppies. Annual Movement for the Abolition of War Remembrance Lecture by Dr Mark Levene, Reader in Comparative History at Southampton University. Ring 01908 511 948 for details. Edinburgh from 12 noon. Demonstration to accompany Nato’s visit. Trident Ploughshares blockade of Aldermaston. the testing of nuclear weapons. weapons and the trading of their components. call to those with them to abolish them.